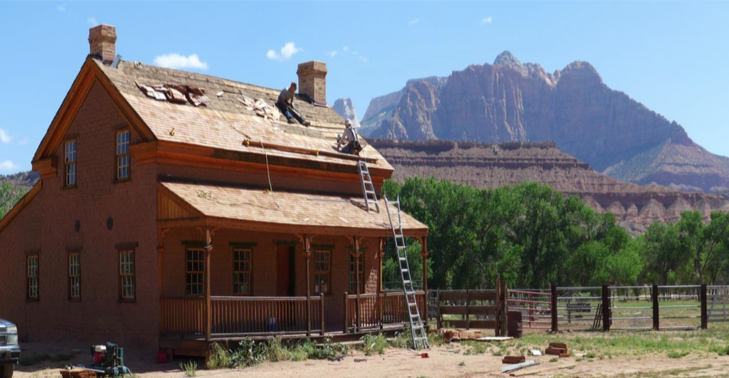 Thanks to funds provided by the Utah Division of State History’s matching grant program and the Town of Rockville, funds were used to complete work on the Russell Home. Repair work included new wood roof shingles on the south side of the home and lathe and plaster replacement on walls and ceilings in two bedrooms on the main floor. In addition, adobe walls and foundation repairs have been completed on the schoolhouse and thanks to Washington County exterior wood on the schoolhouse has been painted. We thank our many partners for their continued support. Another story is from Mary Smith of Colorado. 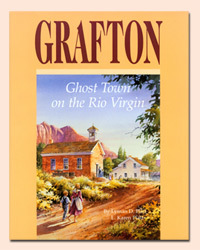 She wanted to buy a book about Grafton. She said, “We have visited Grafton numerous times since the mid-1980s. Odd story — with a name like Smith, when it came to naming our third son in 1999, we decided we would look at the atlas rather than the baby name book. We never got that far because my husband immediately suggested Grafton as a name, and we knew it was the right fit for us. Grafton was in Grafton on his first birthday.” We also had a note on a donation envelope from Clive Grafton-Reed from England who had to see Grafton because of shared name. Another note was from Mark who lives in Grafton, Massachusetts, this is a cool town to tour. 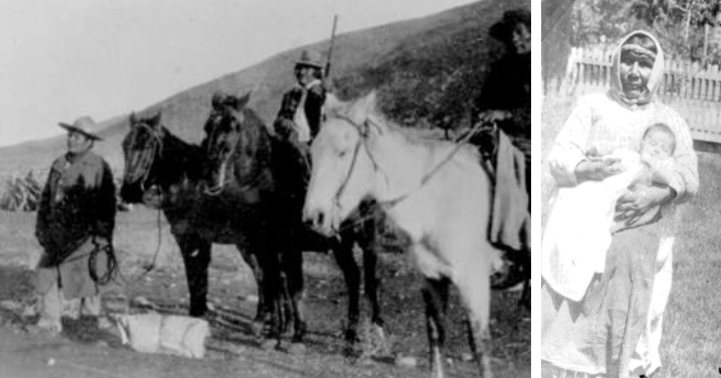 Starting left to right, Cedar Pete (1830-1890); Bill or Wiley, son of Poinkum and Mary (1883-1897); Poinkum (1847-1905); Puss, son of Poinkum and Mary born 1887 is also buried at the cemetery, but not in the picture. Mary is not buried in the cemetery and her picture on right is from Sherratt Library. The annual Grafton Reunion, will be held on September 26, 2015 from 12-2:00 PM. Bring your lunch, hat, chair and memories to share. The Partnership will have a display of historic pictures in the schoolhouse and items such as books, pictures of Grafton and t-shirts. There will be a program and if you have any stories you would like to tell about Grafton or a song to sing, call us (phone 435-635-2133) Everyone is welcome. Joe Charbonneau set up a Grafton Reunion Facebook page. Where anyone can upload photos, histories, at https://www.facebook.com/graftonutah . It is also posted on our webpage. As a great friend to Grafton, I hope you know how much you mean to us and how important your role is to help us preserve Grafton. Donations are gratefully received and tax deductible. You can donate by mailing a check, or by using a credit card on our secure web page at www.graftonheritage.org. Just click on Support Us. Or remember us in your will. We also updated our web site with some of our historic photos.